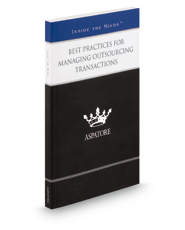 Best Practices for Managing Outsourcing Transactions provides an authoritative, insider's perspective on drafting adaptable service-level agreements in a global environment. Experienced partners from law firms across the nation outline the necessary components for outsourcing deals and explore best practices for managing data security. These top lawyers offer advice on understanding how agreement terms apply outside the United States, engaging in cloud sourcing for IT transactions, and helping clients maintain their relationships with vendors. Covering a range of topics from understanding a client's business goals before engaging in outsourcing to updating deals as necessary, these experts stress the importance of creating secure partnerships during transactions and discuss key strategies for building perceived changes into an agreement's structure. The different niches represented and the breadth of perspectives presented enable readers to get inside some of the great legal minds of today, as these experienced lawyers offer up their thoughts on the keys to success within this evolving legal field.